Pfäffikon / Switzerland, 05.10.2007. The Swiss cooling solution provider – ARCTIC COOLING has launched Silentium T ECO 80 – a new high efficient and eco friendly PC case that is designed to provide enough power for quad core CPU and dual video card configurations under continuous full load operation, fulfilling the enthusiast gamers demanding requirements. To create a greener world for everyone, ARCTIC COOLING has introduced the ECO 80 – a new performance standard for power supplies. ECO 80 stands for absolute environmentally friendly. 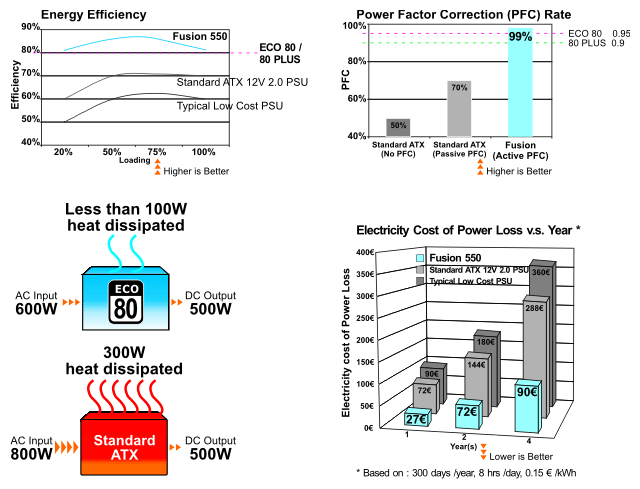 ECO 80 requires not only an 80 Plus™ efficiency level but also requires a Power Factor Correction (PFC) above 95% instead of just 90% (80 Plus™). The higher PFC ensures the apparent power consumption is close to the real power usage. As a result the ECO 80 PSU improves the power quality, reducing power losses and minimizing electricity costs. The Silentium T ECO 80 is equipped with a 550W PSU that totally fulfills the ECO 80 standard and delivers a minimum efficiency of 82% and 86% at typical loads respectively. Furthermore, the Silentium T ECO 80 PSU is an active PFC with a typical power factor of 99%. This not only saves energy costs, but the Silentium T ECO 80 PSU also increases the reliability of the PC system by generating less heat, reducing the required fan speed and noise level, increasing component life and improving the comfort of the users environment. Inherited from its predecessor (Silentium T Pro), reducing the noise to an absolute minimum and achieving a maximum airflow are also the design goals of the Silentium T ECO 80. The radical new thermodynamic concept allows the air flow and the PSU position to be completely rearranged to enhance the overall ventilation. All Arctic Fans are temperature controlled and contain patented vibration absorption in order to lower the noise level. Together with the help of the special HDD muffler, multiple hard disk noise and vibration can be eliminated by encapsulating them into the absorbers. Furthermore the screwless design of the Silentium T ECO 80 is torsion resistant and offers extensive features for power users. 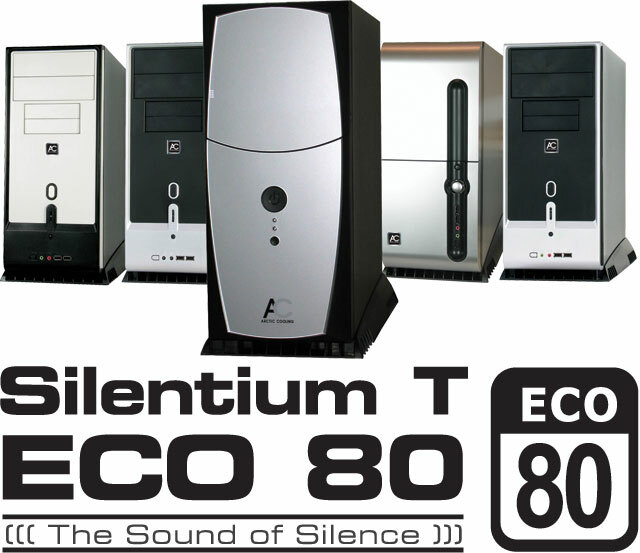 The Silentium T ECO 80 series is available now in 5 different front panel configurations. The MSRP is USD 134.95 and Euro 99.95 (excl VAT).